There are Pencil, Scripsit, hundreds of mailing lists, and now here comes another one. But hold on, this package is different. The WORDPROCESSING package has tremendous flexibility. It consists of two major machine language programs called Mailform and Mailrite. Also included are 4 special purpose programs called Extract, Sort, Label, and Convert. With this software you can set up a name and address list, call up a text that you have written either with Pencil or Scripsit and print custom written letters combining the information from both files. Available fields and their lengths: Name (25 chr), Company (25 chr), Address (25 chr), City (18 chr), State (2 chr). Zip (5 chr), Data or coding (2 at 14 chr each). Language & Procedures Machine language. In-memory storage of data, no waiting for disk I/O. Uses a screen overwrite system. Easy to enter and edit data. Full cursor control, repeating key entry by holding it down. Commands include get previous and next record, delete record(s), store and get from memory, read and write file to disk, define a search field, sort, continue search, and exit to DOS. The program works very well. The ability to sort via any field, the speed of data entry, and the ease of editing are all very impressive. The authors have taken much care in designing this program. It is very well error trapped. If you give an invalid command, the cursor will jump to the error (e.g. missing filespec) and force you to do it correctly. It is impossible to enter past the field lengths. Warning signals are given by triggering the cassette relay, and included is a diagram for a beeper to be connected if you wish. After some effort, we got the program to crash (force in a very high record number and the program will go into ROM looking for the data), but in all likelihood, you will never go wrong entering commands or data. By defining search fields and merging files from one list to another, you have tremendous flexibility. You could take a number of lists and merge together all those within a given town; you could select to have letters sent only to company presidents that live in California. With the Extract, search, sort, and merge routines you have true data manipulation. There are some drawbacks. You can set up a file of at most 316 names in memory at one time. Very large mailing lists would require subdivision into a number of files. Tire documentation is very weak. In fact, a command is shown on the video (X^extract) which is not mentioned in the 16 page manual. I would be afraid to give the manual to a non-programmer. For example, describing the Get Record command: 'If the memory buffer is empty or the record number is not numeric or from 1 to LRN (Last Record Number in buffer) inclusive, th§ cursor will be moved to the RECORD # field and ..." I pity the poor office worker trying to follow all that. Lastly, the commands are entered via a control key system that is awkward to use. The control key is the SHIFT AND DOWN ARRQW, and then simultaneously depress the desired function key. If you have the lovy^r case modification and an Electric Pencil control key, they may be used instead. The second program in the package is Mailrite. It is a program that allows you to print letters, envelopes, or labels from a master mailing list (made with Mailform), and a text file made with Electric Pencil or Scripsit. Language & Procedures Mailrite is also machine language, very fast and cleanly written. You set the printer parameters with Mailrite. The actual locations for name, address, etc. to be inserted into the text are flagged within the text. You identify what and where additions are to be made when the text is being written with either Electric Pencil or Scripsit. You have the ability to underline passages, change to boldface (if your printer can do it! ), reset margins and so on. You can halt during printing and quit or continue. Also very sophisticated. Operates like Mailform. Some new commands added for use with the text writers to flag where the data is to be inserted. An added routine for Radio Shack Mail list users is included. The program called Convert will take your Radio Shack mail lists and alter the data to fit the Mailform structure. A nice touch, not having to reenter all that data. An impressive package. Well designed and error trapped. It is quite a ppwerful addition for Electric Pencil and Scripsit users. If all you want is a mailing list program, you don't need it. If you don't have Electric Pencil or Scripsit, you don't want it. Documentation and user manual is rather skimpy. Plan on playing with this program quite a bit before bringing it to the office. 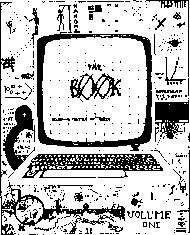 Assembly language programming, or you just want to know more about your TRS-80 ROM, "THE BOOK" is for you. Volume I will give you access to over fifty machine language subroutines in the Radio Shack Level II BASIC. It includes information on the numeric data formats and a commented listing of the ROM routines. "THE BOOK, Volume I", encompasses all arithmetic functions and mathematical operations. There are separate routines for integers, single precision, and double precision numbers and the data format for each of these number types is explained. The routines that perform ASCII to binary and binary to ASCII conversion are identified and explained to provide you a means of data I/O. A fully commented listing provides the details on the step-by-step execution of these ROM routines. Although a complete disassembly is not provided in order to avoid copyright infringement, you can obtain a complete disassembly using the disassembler program listed in "THE BOOK." Volume I also includes a complete, detailed memory map of the entire machine and a symbol table noting over 500 addresses. "THE BOOK" will save you hour upon hour of assembler program development time. Don't start programming without it. Order your copy of "THE BOOK", today! insiders Software Consultants, Inc.
Springfield, VA 22152 Tandy corp.
□ Please send me Volume I of THE BOOK at $14.95 plus $1.50 for postage.